Ancient Western philosophy is marked by the formation and development of philosophy from around the sixth century B.C.E. to the sixth century C.E., and is defined largely by the three great thinkers: Socrates (fifth century B.C.E. ), his student Plato (fourth century B.C.E. ), and Plato's student Aristotle (fourth century B.C.E.). They laid the foundations of Western philosophy by exploring and defining the range, scope, method, terminology, and problematics of philosophical inquiry. Ancient Western philosophy is generally divided into three periods. First, all thinkers prior to Socrates are called PreSocratics; the second period spans the lifetimes of Socrates, Plato, and Aristotle; the last period covers diverse developments in philosophy, which includes the Stoics, Epicureans, Skeptics, Neo-Platonists, and Aristotelians. The end of Ancient Philosophy is marked by the spread of Christianity in the sixth century C.E..
Greek philosophers prior to Socrates are called Pre-Socratics or pre-Socratic philosophers. They were the earliest Western philosophers, active during the fifth and sixth centuries B.C.E. in ancient Greece. These philosophers tried to discover original principles (arkhế; ἀρχή; the origin or the beginning) that could uniformly, consistently, and comprehensively explain all natural phenomena and the events in human life without resorting to mythology. They initiated a new method of explanation known as philosophy which has continued in use until the present day, and developed their thoughts primarily within the framework of cosmology and cosmogony. Socrates was a pivotal philosopher who shifted the central focus of philosophy from cosmology to ethics and morality. Although some of these earlier philosophers were contemporary with, or even younger than Socrates, they were considered pre-Socratics (or early Greek Philosophers) according to the classification defined by Aristotle. The term "Pre-Socratics" became standard since H. Diels' (1848-1922) publication of Fragmente der Vorsokratiker, the standard collection of fragments of pre-Socratics. It is assumed that there were rich philosophical components in the religious traditions of Judaism and Ancient Egyptian cultures, and some continuity of thought from these earlier traditions to pre-Socratics is also assumed. Although we do not have much information about their continuity, Proclus, the fifth century Neo-Platonist, for example, noted that the earliest philosophy such as Thales studied geometry in Egypt. The pre-Socratic style of thought is often called natural philosophy, but their concept of nature was much broader than ours, encompassing spiritual and mythical as well as aesthetic and physical elements. They brought human thought to a new level of abstraction, raised a number of central questions of ontology, which are still relevant today, and cultivated the human spirit so as to open our eyes to the eternal truth. Primary sources for their philosophical discourses have all been lost except in a fragmentary form preserved in the works of various doxographers, and the best source is Aristotle. 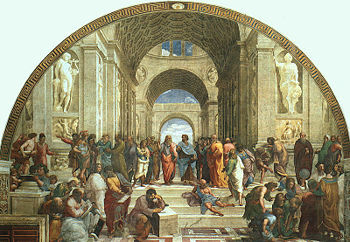 Although Aristotle’s interpretation of their thought dominated for centuries, modern scholars have gone beyond Aristotle to identify the original and unique contributions of the pre-Socratics. In Athens, cultural activities such as tragedy flourished around fourth and fifth century B.C.E.. Early philosophical activities, however, emerged in Eastern colonies of Asia Minor and Western Italian colonies. In Ionian colonies, the pursuit of material principle was primary and naturalism, holyzoism, and materialism developed. In Italian colonies, however, the pursuit of religious principles, logic, and mathematics developed. The Ionian School, a type of Greek philosophy centred in Miletus, Ionia in the sixth and fifth centuries B.C.E., is something of a misnomer. Although Ionia was a centre of Western philosophy, the scholars it produced, including Anaximander, Anaximenes, Heraclitus, Anaxagoras, Diogenes Apolloniates, Archelaus, Hippon, and Thales, had such diverse viewpoints that it cannot be said to be a specific school of philosophy. Aristotle called them physiologoi meaning 'those who discoursed on nature', but he did not group them together as an "Ionian school." The classification can be traced to the second century historian of philosophy Sotion. They are sometimes referred to as cosmologists, since they were largely physicalists who tried to explain the nature of matter. Most cosmologists thought that although matter can change from one form to another, all matter has something in common which does not change. They did not agree what it was that all things had in common, and did not experiment to find out, but used abstract reasoning rather than mythology to explain themselves, thus becoming the first philosophers in the Western tradition. Later philosophers widened their studies to include other areas of thought. The Eleatic school, for example, also studied epistemology, or how people come to know what exists. But the Ionians were the first group of philosophers that we know of, and so they remain historically important. Thales (Greek: Θαλης) of Miletus (ca. 624 B.C.E. - 545 B.C.E.) is generally understood as the earliest western philosopher. Before Thales, the Greeks explained the origin and nature of the world through myths of anthropomorphic gods and heroes. Phenomena like lightning or earthquakes were attributed to actions of the gods. By contrast, Thales attempted to find naturalistic explanations of the world, without reference to the supernatural. He explained earthquakes by imagining that the Earth floats on water, and that earthquakes occur when the Earth is rocked by waves. Thales identified "water" as the ultimate principle or the original being, and held that all other beings were consisted of this ultimate element. Since no information source is available except short fragments, we do not know much about his reasoning. We can only speculate a number of reasons why he identified water as the universal, original element: water can take three forms (liquid, gas, slid) in natural temperatures; the circulation of water is vital to changes in nature; it is the vital element of life; finally, it is often used for religious rituals, such as those that involve "purification." Anaximander (Greek: Άναξίμανδρος) (611 B.C.E. – ca. 546 B.C.E.) has a reputation which is due mainly to a cosmological work, little of which remains. From the few extant fragments, we learn that he believed the beginning or first principle (arche, a word first found in Anaximander's writings, and which he probably invented) is an endless, unlimited, and unspecified mass (apeiron), subject to neither old age nor decay, which perpetually yields fresh materials from which everything we can perceive is derived. We can see a higher level of abstraction in Anaximander's concept of "unlimited mass" than earlier thinker like Thales who identified a particular element ("water") as the ultimate. Anaximenes (Greek: Άναξιμένης) of Miletus (585 B.C.E. - 525 B.C.E.) held that the air (breath), with its variety of contents, its universal presence, its vague associations in popular fancy with the phenomena of life and growth, is the source of all that exists. Everything is air at different degrees of density, and under the influence of heat, which expands, and of cold, which contracts its volume, it gives rise to the several phases of existence. The process is gradual, and takes place in two directions, as heat or cold predominates. In this way was formed a broad disk of earth, floating on the circumambient air. Similar condensations produced the sun and stars; and the flaming state of these bodies is due to the velocity of their motions. Heraclitus (Greek: Ἡράκλειτος) of Ephesus (ca. 535 - 475 B.C.E.) disagreed with Thales, Anaximander, and Pythagoras about the nature of the ultimate substance and claimed instead that everything is derived from the Greek classical element fire, rather than from air, water, or earth. This led to the belief that change is real, and stability illusory. For Heraclitus "Everything flows, nothing stands still." He is also famous for saying: "No man can cross the same river twice, because neither the man nor the river are the same." His concept of being as process or flux showed a sharp contrast with Parmenides who identified being as immutable. Empedocles (ca. 490 B.C.E. – ca. 430 B.C.E.) was a citizen of Agrigentum, a Greek colony in Sicily. Empedocles' philosophy is best known for being the origin of the cosmogenic theory of the four classical elements. He maintained that all matter is made up of four elements: water, earth, air, and fire. Empedocles postulated something called Love (philia) to explain the attraction of different forms of matter, and of something called Strife (neikos) to account for their separation. He was also one of the first people to state the theory that light travels at a finite (although very large) speed, a theory that gained acceptance only much later. Diogenes Apolloniates (ca. 460 B.C.E.) was a native of Apollonia in Crete. Like Anaximenes, he believed air to be the one source of all being, and all other substances to be derived from it by condensation and rarefaction. His chief advance upon the doctrines of Anaximenes is that he asserted air, the primal force, to be possessed of intelligence—"the air which stirred within him not only prompted, but instructed. The air as the origin of all things is necessarily an eternal, imperishable substance, but as soul it is also necessarily endowed with consciousness." Archelaus was a Greek philosopher of the fifth century B.C.E., born probably in Athens, though Diogenes Laërtius (ii. 16) says in Miletus. He was a pupil of Anaxagoras, and is said by Ion of Chios (Diogenes Laërtius, ii. 23) to have been the teacher of Socrates. Some argue that this claim is probably only an attempt to connect Socrates with the Ionian School; others (e.g. Gomperz, Greek Thinkers) uphold the story. There is similar difference of opinion as regards the statement that Archelaus formulated certain ethical doctrines. In general, he followed Anaxagoras, but in his cosmology he went back to the earlier Ionians. Pythagoras (c. 570 B.C.E.-496 B.C.E. ), Greek: Πυθαγόρας) was a mystic, and a mathematician, known best for the Pythagorean theorem. The earliest Greek philosophers in Ionia, known as the Ionians, such as Thales, Anaximander, and Anaximenes, explored the origin of existing beings and developed theories of nature in order to explain the natural processes of the formation of the world. Pythagoras, who was born on an island off the coast of Ionia and later moved to Southern Italy, explored the question of the salvation of human beings by clarifying the essence of existing beings, and developing a mystical religious philosophy. Pythagoras developed both a theoretical foundation and a practical methodology, and formed an ascetic religious community. Followers of Pythagoras are known as Pythagoreans. Pythagoras approached the question of being from an angle that was different from that of early Ionian philosophers. While the Ionians tried to find the original matter out of which the world is made, Pythagoras dove into the principles that give order and harmony to the elements of the world. In other words, Pythagoras found the essence of being not in “what is to be determined” but in “what determines.” From Pythagoras’ perspective, the Ionians’ prime elements, such as Thales’ “water” and Anaximander’s “indefinite,” were beings that were equally determined, and they did not explain why and how the world was orderly structured and maintained its rhythm and harmony. According to Pythagoras, “number” or mathematical principle was that which gives order, harmony, rhythm, and beauty to the world. This harmony keeps a balance both in the cosmos and in the soul. For Pythagoras, “numbers” are not abstract concepts but embodied entities manifested as norms, cosmos, and sensible natural objects. The mathematical order in beings is perceivable not by the physical senses but by senses of the soul. Unlike the modern concept of mathematical exercises, Pythagoras conceived mathematics as the method for liberating the soul from the bondages of bodily senses and essentially as religious training. For Pythagoras, the soul is immortal and the cultivation of the soul is achieved by the studies of truth and the ascetic life. Aristotle noted that Pythagoras was the first person who took up the issue of “virtue” in philosophy (DK. 58B4). Pythagoras opened a new path to early Greek ontology by his focus on the soul, virtue, and the ascetic life. He presented a new integral model of thought where the mystic and the mathematical or the religious and the scientific (as well as the aesthetic) are uniquely integrated. This type of thought is uncommon in mainstream philosophy today. Like other wise men of antiquity, Pythagoras had a broad knowledge encompassing medicine, music, cosmology, astronomy, mathematics, and others. Finally, his thought made a strong impact on Plato which is seen through his works. The Eleatics were a school of pre-Socratic philosophers at Elea, a Greek colony in Campania, Italy. The group was founded in the early fifth century B.C.E. by Parmenides. Other members of the school included Zeno of Elea and Melissus of Samos. Xenophanes is sometimes included in the list, though there is some dispute over this. The school took its name from Elea, a Greek city of lower Italy, the home of its chief exponents, Parmenides and Zeno. Its foundation is often attributed to Xenophanes of Colophon, but, although there is much in his speculations which formed part of the later Eleatic doctrine, it is probably more correct to regard Parmenides as the founder of the school. Xenophanes had made the first attack on the mythology of early Greece in the middle of the sixth century, including an attack against the whole anthropomorphic system enshrined in the poems of Homer and Hesiod. In the hands of Parmenides this spirit of free thought developed on metaphysical lines. Subsequently, either because its speculations were offensive to the contemporary thought of Elea, or because of lapses in leadership, the school degenerated into verbal disputes as to the possibility of motion and other such academic matters. The best work of the school was absorbed into Platonic metaphysics. The Eleatics rejected the epistemological validity of sense experience, and instead took mathematical standards of clarity and necessity to be the criteria of truth. Of the members, Parmenides and Melissus built arguments starting from indubitably sound premises. Zeno, on the other hand, primarily employed the reductio ad absurdum, attempting to destroy the arguments of others by showing their premises led to contradictions (Zeno's paradoxes). The main doctrines of the Eleatics were evolved in opposition to the theories of the early physicalist philosophers, who explained all existence in terms of primary matter, and to the theory of Heraclitus, which declared that all existence may be summed up as perpetual change. The Eleatics maintained that the true explanation of things lies in the conception of a universal unity of being. According to their doctrine, the senses cannot cognize this unity, because their reports are inconsistent; it is by thought alone that we can pass beyond the false appearances of sense and arrive at the knowledge of being, at the fundamental truth that the All is One. Furthermore, there can be no creation, for being cannot come from non-being, because a thing cannot arise from that which is different from it. They argued that errors on this point commonly arise from the ambiguous use of the verb to be, which may imply existence or be merely the copula which connects subject and predicate. Though the conclusions of the Eleatics were rejected by the later Presocratics and Aristotle, their arguments were taken seriously, and they are generally credited with improving the standards of discourse and argument in their time. Their influence was likewise longlasting—Gorgias, a Sophist, argued in the style of the Eleatics in his work "On Nature or What Is Not," and Plato acknowledged them in the Parmenides, the Sophist and the Politicus. Furthermore, much of the later philosophy of the ancient period borrowed from the methods and principles of the Eleatics. Leucippus or Leukippos (Greek: Λεύκιππος, first half of fifth century B.C.E.) was among the earliest philosophers of atomism, the idea that everything is composed entirely of various imperishable, indivisible elements called atoms. Democritus (Greek: Δημόκριτος) was a pre-Socratic Greek philosopher (born at Abdera in Thrace ca. 460 B.C.E. - died ca 370 B.C.E.). Democritus was a student of Leucippus and co-originator of the belief that all matter is made up of various imperishable, indivisible elements which he called atoma (sg. atomon) or "indivisible units," from which we get the English word atom. It is virtually impossible to tell which of these ideas were unique to Democritus and which are attributable to Leucippus. The Greek words sophos or sophia had the meaning of "wise" or "wisdom" since the time of the poet Homer, and originally connoted anyone with expertise in a specific domain of knowledge or craft. Thus a charioteer, a sculptor, a warrior could be sophoi in their occupation. Gradually the word came to denote general wisdom (such as possessed by the Seven Sages of Greece), this is the meaning that appears in the histories of Herodotus. At about the same time, the term sophistes was a synonym for "poet," and (by association with the traditional role of poets as the teachers of society) a synonym for one who teaches, especially by writing prose works or speeches that impart practical knowledge. In the second half of the fifth century B.C.E., and especially at Athens, "sophist" came to denote a class of itinerant intellectuals who employed rhetoric to achieve their purposes, generally to persuade or convince others. Most of these sophists are known today primarily through the writings of their opponents (specifically Plato and Aristotle), which makes it difficult to assemble an unbiased view of their practices and beliefs. Many of them taught their skills, apparently often for a fee. Due to the importance of such skills in the litigious social life of Athens, practitioners of such skills often commanded very high fees. The practice of taking fees, coupled with the willingness of many sophists to use their rhetorical skills to pursue unjust lawsuits, eventually led to a decline in respect for practitioners of this form of teaching and the ideas and writings associated with it. Protagoras is generally regarded as the first of these sophists. Others included Gorgias, Prodicus, Hippias, Thrasymachus, Lycophron, Callicles, Antiphon, and Cratylus. In Plato's dialogs, Socrates challenged their moral relativism by arguing the eternal existence of truth. The philosopher Socrates (470 B.C.E. - 399 B.C.E.) of Athens. 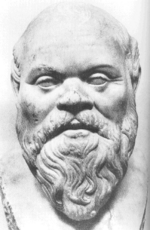 Socrates was the central figure in Ancient Greek philosophy. He shifted the center of inquiry from natural phenomena, the primary concern of his predecessors, to the questions of human life. Based upon the Pythagorean belief of the immortality of the soul, Socrates challenged materialists and the moral relativism of Sophists. A few points in his philosophy include that the cultivation of the soul must be the primary issue of human life, the soul can be cultivated only by controlling desires of flesh, and that genuine knowledge is the realization of truth, which is sharply distinguished from mere opinions. Socrates left no writings and his student Plato depicted him as the main character of his dialogues, for dialogue was Socrates' primary philosophical methodology in uncovering the truth. Through dialogue, one is led to give up all presuppositions and previously held opinions; through having give-and-take with a figure like Socrates, one is awakened to true knowledge. This process is a challenging one, in which the acknowledgement of one's ignorance is a necessary step in realizing the truth. The characters in Plato's dialogues are often uneasy, irritated, and upset by the questions posed by Socrates. The phrase "Know yourself," the inscription at the Temple of Apollo at Delphi, is ascribed to Socrates. Socrates was said to be the wisest of all because of his self-awareness of his ignorance of truth. Plato (approximately 428 B.C.E. – approximately 348 B.C.E.) is perhaps the most famous and influential thinker in the history of western thought. He was a student of Socrates and a teacher of Aristotle. He founded the Academy in Athens where he lectured and taught. He also wrote dialogues on a variety of philosophical subjects such as metaphysics, epistemology, ethics, psychology, politics, and aesthetics. Because he wrote in dialogue rather than treatise form, however, his ideas on these subjects are not systematically analyzed but presented in the more ambiguous and ironic form of the drama. This has resulted in a variety of interpretations of Plato’s work and debates continue today over the precise meanings of his main philosophical ideas. Among the most famous of his philosophical contributions are the accounts he provides of his teacher Socrates and the Socratic method of teaching, his Doctrine of the Ideas or Forms, his theory of recollection, and his notion of dialectic as collection and division. His book the Republic remains one of the classic works in all of western civilization. Aristotle (Greek: Ἀριστοτέλης Aristotélēs) (384 B.C.E. – 322 B.C.E.) was a student of Plato and teacher of Alexander the Great. His work encompassed diverse subjects, covering almost all areas of thought, and established one of the most comprehensive and broad systems of thought in the history of philosophy. He wrote on diverse subjects, including physics, metaphysics, poetry (including theater), logic, rhetoric, politics, government, ethics, biology, and zoology. Aristotle established the foundation of philosophy and other diverse disciplines by clarifying methodological differences according to types of inquiry and subject matter. As a part of his philosophical endeavor, Aristotle also assessed his predecessors and wrote a history of philosophy. Our knowledge about Pre-Socratics owes much to Aristotle's work. Thomas Aquinas (c. 1225 – March 7, 1274) incorporated Aristotle's philosophy, which had been preserved by Islamic scholars, into Christianity and built Christian theology and philosophy based upon Aristotle's philosophy. This made Aristotle's impact decisive on the intellectual history of the West. Aristotle was a great thinker and philosopher, and was called 'the master' by Avicenna, and his views and approaches dominated early Western science for almost 2,000 years. With the death of Aristotle in B.C. 322, classical Ancient Philosophy came to an end, and the period until the third century C.E. is known as the Hellenistic period. In the early half of this period (until the middle of the fist century C.E. ), practical philosophy flourished and the three major schools or styles of thought that developed were Stoicism, Epicureanism, and Skepticism. The latter half of Hellenist period adopted a religious orientation and Neo-Platonism florished. The spread of Christianity through the Roman Empire ushered in the end of the Hellenistic philosophy and the beginnings of Medieval Philosophy. See also hyperlinks in each section for various schools of thought and individual thinkers. ↑ Encyclopedia Britannica. Democritus. Retrieved May 5, 2008. ↑ Internet Encyclopedia of Philosophy. Democritus. Retrieved May 5, 2008. Armstrong, A. H. The Cambridge History of Later Greek and Early Medieval Philosophy. London: Cambridge U.P., 1967. Burnet, John. Early Greek Philosophy. London: A. & C. Black, 1930. Guthrie, W. K. C. A History of Greek Philosophy. Cambridge: University Press, 1962. Ancient Greek philosophy, The Internet Encyclopedia of Philosophy. History of "Greek philosophy, Ancient"
This page was last modified on 14 July 2017, at 23:17.